I’ve started to notice a new beverage being offered on tap in bars and restaurants where I live in NYC. My husband, who travels to Portland, Oregon regularly for work, has noticed the same thing: kombucha, a tea made from bacteria and yeast cultures, is now being sold alongside micro-brews and house-fermented liquors all over the country. While kombucha has been used for centuries in Asian countries, it has only been flowing into mainstream American culture for about the last 10 years or so. In fact, it is such a popular health craze, you can buy your own starter kit and make your own versions and flavors. Made by adding cultures of bacteria and yeast to a mixture of tea, sugar, and sometimes fruit juices, kombucha is often called a “mushroom-tea” because of the large mushroom cap that emerges during the fermentation process. Kombucha is slightly carbonated, with a mildly tart flavor. It’s very acidic and contains B vitamins, antioxidants, and sugar. A bit of sediment at the bottom of your glass is normal, as these are the beneficial bits of bacteria in the mix. It contains about 30 calories per serving, is typically served cold, and is extremely refreshing. Can you catch a buzz? Don’t let the fact that kombucha is now being sold in bars fool you: there is typically very little alcohol content (usually less that 0.5 percent) that occurs during the fermentation process. Some home brewers have been known to ramp up the alcohol until it approaches that of a very weak beer, but check with your bartender or brewer to determine the exact percentage of alcohol content in the kombucha being offered. It’s potentially a great drink for the designated driver or others who are abstaining. Kombucha has been hailed as a miracle drink. It’s been rumored to aid in digestion, elevate the immune system, and some fans even believe it prevents cancer and cures arthritis. There have been very few studies regarding the conclusive benefits of drinking kombucha, although proponents of the drink swear they reap benefits. As with any holistic health trend, it’s probably best to exercise prudence and not expect a health overhaul. 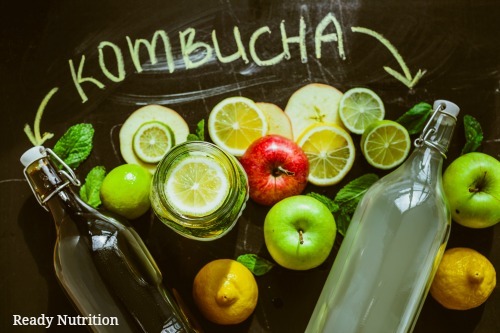 Kombucha is certainly a great alternative to sugary soda, and the fact that it’s sold in bars now means another, much healthier, offering for teetotalers. As with all things alterna-health, it’s best not to overdo it: the Mayo clinic has shown side effects including upset stomach and allergic reactions in those who consume very large quantities. A bigger concern is that kombucha tea is sometimes brewed in homes under nonsterile conditions, making contamination and infection an issue. Be very wary of any brewing process that involves ceramic pots—because kombucha is highly acidic, the acids in the tea can potentially leach lead and other contaminants from the ceramic glaze. If a bar is serving kombucha on tap, they will be able to fill you in on the entire in-house process so you can ensure you are drinking a high-quality, delicious tea.